✨What is Your Favorite Holiday Movie? Home Alone, Miracle on 34th Street and they never get old. ✨What is Your Favorite Christmas Color? Red and silver. ✨Stay in Your PJs Or Dress Up For Christmas? I always dress up. ✨If You Could Only Buy One Person a Present This Year Who Would It Be? WOW, can "one" person just be one age group, all the kids in my life? This is a hard one. I love buying presents for everyone. ✨Do You Open Your Present Christmas Eve Or Christmas Morning? It used to be Christmas Eve when I was a kid though we saved the Santa presents for Christmas morning. Now we open them Christmas morning. ✨What Do You Like To Do On Your Christmas Break? Wait, there's a Christmas Break? I don't seem to get an actual break, but I do allow myself a holiday movie or two throughout my day as I'm working. ✨Any Christmas Wishes? To have my house done so we can actually enjoy it for awhile before we sell it. Safe travels for everyone over the holidays and world peace. Was that too Miss America? I really do want peace for EVERYONE! ✨Candy cane or Gingerbread men? 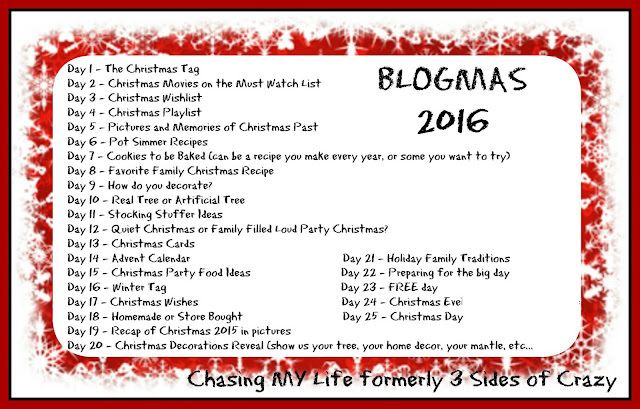 I like the chalk style peppermint, but not real keen on actual candy canes and I like soft gingerbread men. ✨What is most important to you about the holidays? That it is genuine and homemade for the most part. It is not a commercial holiday for me. I believe in trying to remember the real reason for the season and keep the Christmas spirit in my heart and life ALL year long. 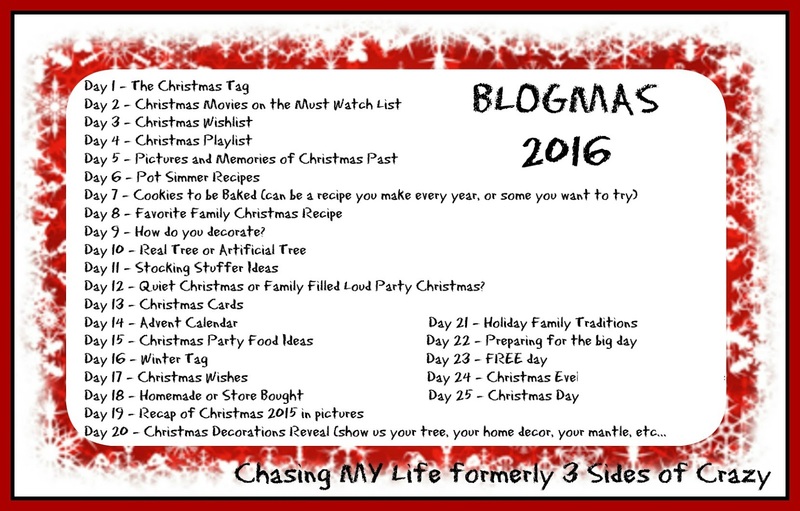 BE SURE AND JOIN UP WITH SANDRA AT DIARY OF A STAY AT HOME MOM TO PLAY ALONG WITH BLOGMAS 2016. Love your list Sweetie! I forgot about HOme Alone. I love that one too! But don't watch it every year. We sure hope to have some down time. I enjoyed sitting on the new carpeted floor yesterday wrapping presents.